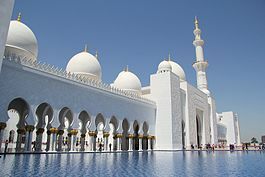 Sheikh Zayed Grand Mosque is considered to be the key site for worship in the country. The mosque was constructed from 1996 to 2007. It is the largest mosque in the United Arab Emirates. The building complex measures approximately 290 m (960 ft) by 420 m (1,380 ft), covering an area of more than 12 hectares (30 acres), exclusive of exterior landscaping and vehicle parking. This article uses material from the Wikipedia article "Sheikh Zayed Mosque", which is released under the Creative Commons Attribution-Share-Alike 3.0 License.